Do His & Her Wedding Rings Need to Match? Matching wedding bands—or his and hers wedding rings—symbolically showcase the unity of marriage. Identically styled bands outwardly display that the couple represents half of the whole, as each has committed to the vows of an eternal partnership. While dual wedding bands are a newer tradition in our country, puzzle rings were popular during the Renaissance. The bands were called Gimmel rings, and these rings were joined together during the wedding but only the woman wore the ring after the ceremony. In the U.S., a double-ring ceremony became popular during the mid 20th century. According to The Knot, the tradition of men wearing a wedding ring began around the time of World War II. Wedding rings at that time were both a comforting symbol for soldiers and served as a visual promise for left-behind brides. Today’s couples almost always exchange dual rings. As traditions have evolved, matching wedding bands became en vogue. The definition of ‘matching,’ though, depends on the couple. 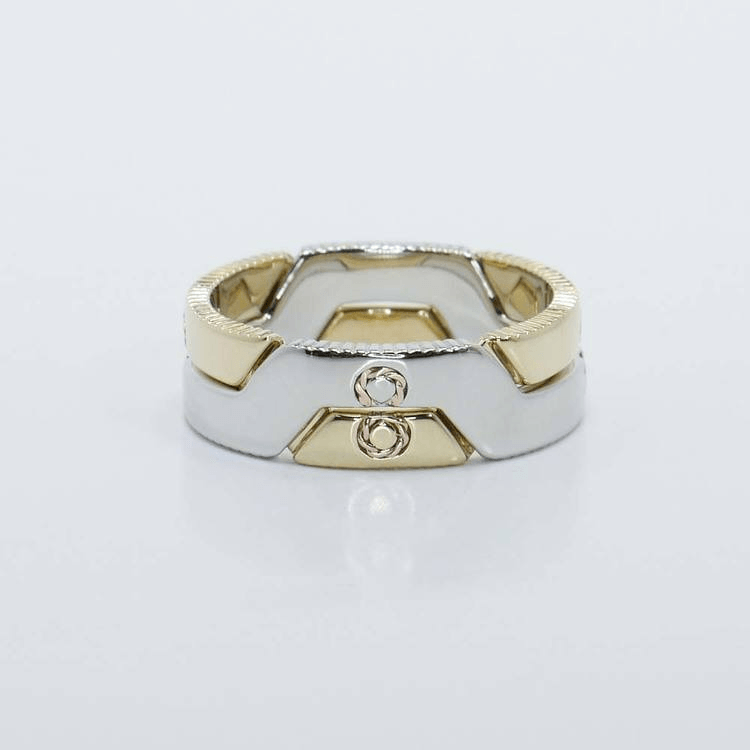 Rings can be designed as identical matches or may just include similar designs or details. While matching his and hers wedding rings are a traditional choice, they are not the only choice for the symbolic sentiment that seals the vows. Matching wedding bands don’t have to be identical to match. In fact, the most amazing matching wedding bands feature details and designs that complement and contrast each other, or showcase a symbolic duality that is as unique as each partner. The choice to exchange matching rings depends on the preference of each couple. Many couples decide on matching bands for the sentimental and symbolic meaning of the ‘match’—it showcases unity and two becoming one. Choosing matching bands also simplifies the shopping decision. When couples decide on one design, the options become less of an issue. Some couples might choose a plain band, while others opt for matching wedding bands with diamonds or other details. Budgeting for matching wedding rings can make the process easier too. Simple wedding bands are often the most inexpensive option. If the groom (or bride!) purchased an expensive engagement ring, the funds for the wedding bands might be limited. Or the couple might just want to save their funds for more lavish details for the wedding day! While matching bands are symbolic of unity, many couples just want a ring that reflects their unique love or personal style. Non-matching bands still seal the same vows and serve as a reminder of the promises made during the ceremony; non-matching bands are not less meaningful in the least. How Do You Style Matching Bands? His and her wedding bands can use complementary designs to create the matching set. His ring may be styled in yellow gold, while her ring might feature blushing rose gold. The designs and details should be similar, but not precise. If her rings includes a row of pave set diamonds, his might include the same detail but larger. Birthstones also may be used as a way to design complementary styles. Her ring may feature his birthstone, and his ring includes hers. While the rings match, they are not identical. 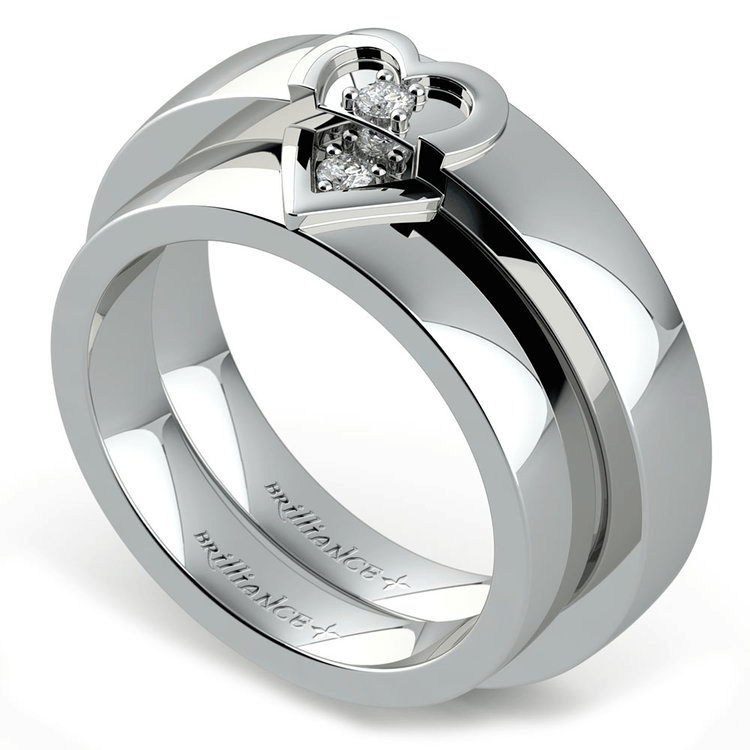 Couples also may integrate matching patterns to create a ring that becomes a piece of a puzzle. Rings can be designed with one half of a heart or one half of an infinity symbol to create a matched design when paired together. Opposites also attract! Design wedding bands that contrast each other in style, shape or color. Use opposing metals like white gold and yellow gold or black ceramic and white platinum. Infuse the designs with other contrasting elements; one ring might feature black diamonds, the other white diamonds. Matching his and her wedding rings showcase the symbolic unions of the partnership, but these bands don’t have to be identically styled to hold meaning. Choose wedding bands with complementary or even contrasting designs to create a wedding set that nods to similarity without duplicating the design. For couples who want their individuality front and center, choose bands that are unique and tailored to each partner’s personality and style. No matter what design is chosen for wedding bands, the meaning behind their symbolism is the most important detail.